As we all know, brushes come in a variety of materials, shapes, and sizes.Most brushes have a handle, a ferrule (the object holding the bristles), andbristles made of synthetic or natural materials.The bristles have a length (measured from the ferrule to the tip) and a width(measured where the bristles exit the ferrule),but what's the brush number?This article describes the brush size numbering system that oftenappears on the handle of paint brushes. Winsor & Newton brushes. From left to right: 000, 0, 2, mini 2, mini 0, mini 00. 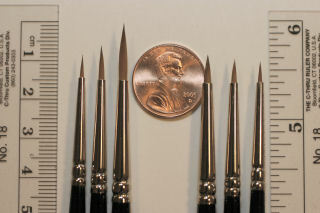 This photo shows a series of brushes from manufacturer Winsor & Newton(warning, this site requires the Flash 5 plugin).To the left of the U.S. penny are round sizes 000, 0, and 2.To the right is their "round miniature" brush sizes 2, 0, and 00.As you can see, similarly numbered brushes are about the same size atthe ferrule, but even two round shapes can have different bristle sizes. 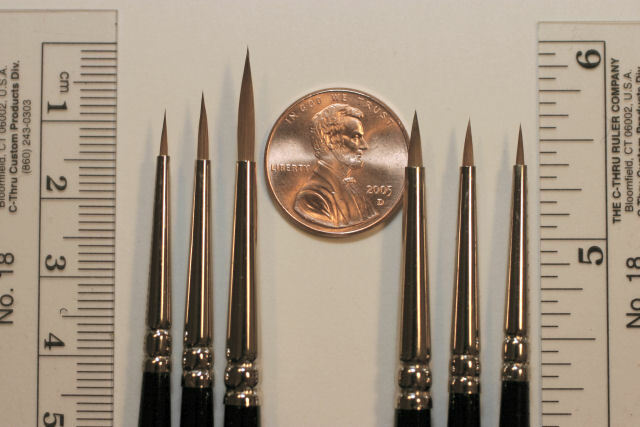 Most miniature painters use a variety of brushes.The size of the brush generally determines how much paint you can loadand carry to your miniature, and how much paint is applied tothe miniature - the width and rate of paint application.For 15 and 28 mm miniatures, the brush sizes 000 through 2 are mostlikely the sizes you will use, with perhaps one or two other sizes forpriming and dry brushing and top coating.Be aware that the brush size notation is arcane and inconsistentfrom manufacturer to manufacturer. More miniatures-related articles are atDan Becker's Miniatures and Models site.Thanks for stopping by and reading about my miniatures. Last modified: Thursday, 09-Jun-2011 12:55:21 MST.